Fuel terminals are technological units demanding a high level of reliability and safety. The operating systems should provided quick and easy access to technological data. Working with highly flammable and hazardous materials puts these systems among those designated to be "Mission Critical Systems" which must in turn provide reliable operation, even during special situations. They must keep on working during a power outage or during the failure of several system components. TAMAS is a fully integrated control system which interfaces with all the necessary equipment that provide automation and dispatching control. 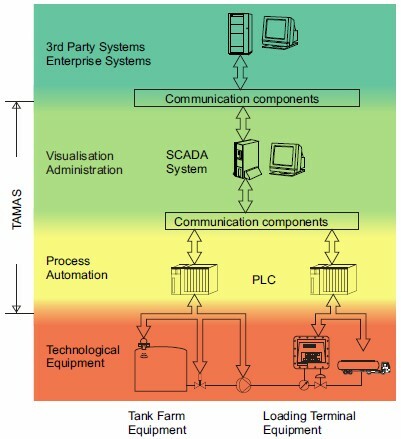 TAMAS is designed as multi-level system as shown on the diagram below. TAMAS is an extremely reliable system thanks to the multi-level architecture design that guarantees safe operation of technological equipment, even if some of the upper levels fail. This term refers to a system of one or more programmable PLC devices which ensure basic algorithms and blockades. All input and output signals as well as the communication lines are led to these PLCs. So, the PLCs have Front-End-Driver (FED) function. To provide a sturdy system with easy expansion and maintenance, each technological part is operated by a separate PLC. These devices communicate mutually and with the upper SCADA system via redundant bus, mostly based on fibre optic cables. The architecture of the system is client/server based. Optional installation of the hot-standby server ensures a smooth operation even during a power outage or disconnection of one of the servers.System of individual users and passwords ensures safety access to data and services, various levels of user privileges as well as administration and development of the system. Servers and clients run PC computers with Windows operating systems and Serck Controls SCX SCADA systems. TAMAS uses the functions of SCX inclusive the user interface, data visualisation, report printing, alarm handling and a collection of technological data stored in the database. 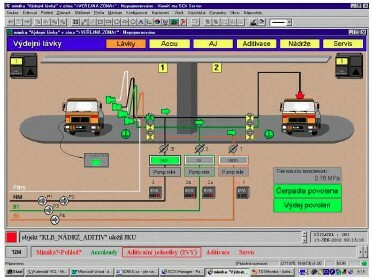 SCX SCADA delivered with the TAMAS system has multi-language support. The system has been designed to guarantee expansion and service to future upgrades. The administration part of the system provides tools for database handling, batch processing and interfacing with enterprise system. The main functions of the application are registration and identification of drivers, clients, trucks and transactions, contract evaluation, loading permissions, certification, configuration of products and additives, printing of loading lists and exporting data to an enterprise system (SQL Server, ORACLE, ODBC).